With a rapid rise in the number of English-speaking satsangis there has grow a keen demand for further literature on Sant Mat, in English. 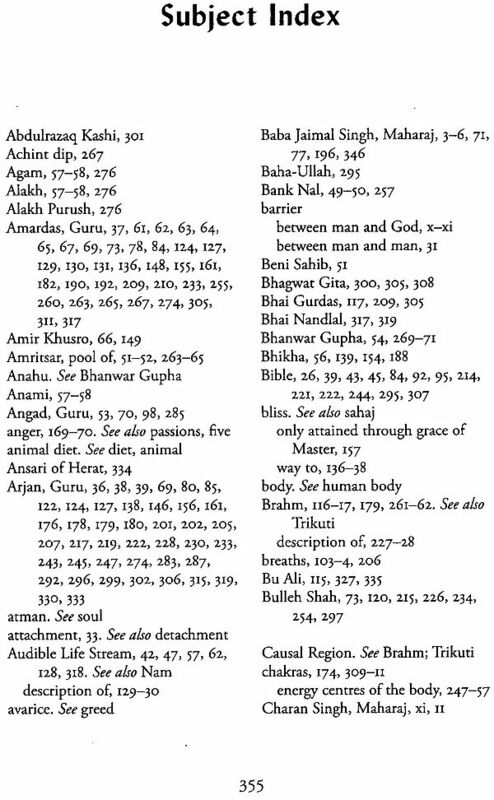 Seeing what a mine of esoteric wealth is contained in the discourses which Maharaj Baba Sawan Singh Ji delivered in the Punjabi Language over a period of nearly four decades, Maharaj Charan Singh Ji asked for these Satsangs to be rendered into English Charan Singh Ji asked for these Satsangs to be rendered into English for the English-speaking initiates and seekers. He personally selected the Satsangs to be translated and gave constant guidance and inspiration during the progress of this work, explaining at length the meaning of the various Shabds and quotations used by Hazur Maharaj Ji. The present volume is meant to meet the demand and is the first of the series to published. The Master has also graciously passed on the copyright, in respect of these publications, to the society, viz: Radha Soami Satsang Beas. It is hoped that this series will meet a long felt want and will greatly benefit all those who wish to understand the great purpose of life and endeavour to realize it. It may, however, be pointed out that no English translation can ever posses the quality of the original work either in freshness or in vigour of thought. For one thing, it is difficult always to find exact equivalents in a foreign language, and for another, idioms, aphorisms and phraseology in their new clothes lose much of their subtlety. For any failings, therefore, in not being able to bring out fully the elegance and excellence of the original Satsangs, the responsibility is entirely ours and we seek the indulgence of our readers. 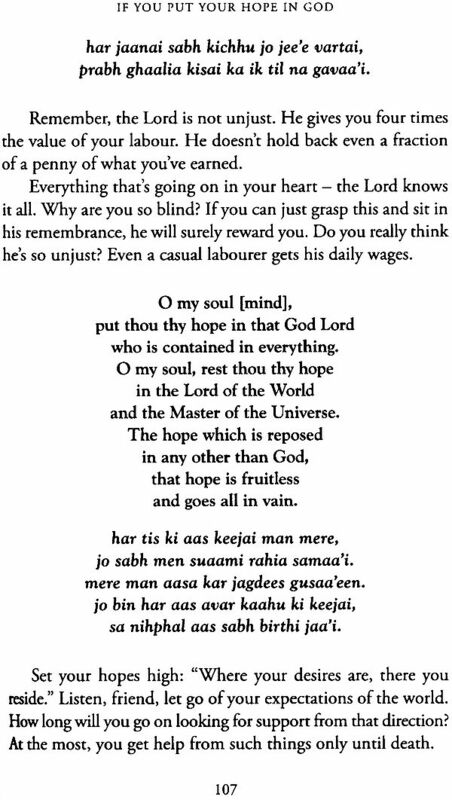 I vividly recall Hazur Maharaj Ji's satsangs. For four decades, they were looked up to as nothing else had been by tens of thousands of people. Every word and every syllable that He uttered became the very life of His disciples. The satsangs thrilled. They inspired. They enthralled the mind and heart of men. They answered all their questions. They resolved all their pressing problems. They met all their needs. Every word was a healing balm that soothed their anguished hearts. Every word was an ambrosial drop that quenched their thirsty souls. It was a memorable sight to watch the vast multitudes listening with rapt attention; men, women and children sitting in pin-drop silence, their faces lit with light, love and peace. The deep and melodious voice of the Master created a musical effect that completely magnetized the audience. Everybody was edified beyond measure and inwardly refreshed. 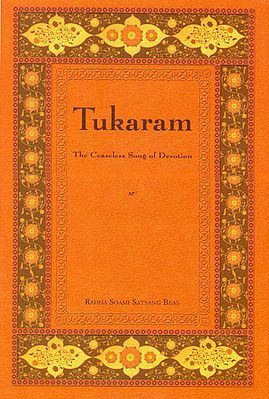 The satsangs given in this volume are so penetrating in thought, so profound in wisdom, so rich in spirituality and yet so lucid, discerning and practical that they leave no room for any addition or elaboration. To do so would be to hold a candle to the sun. Saints of all ages and countries have sung the same one song. They have all preached the same one Truth. They have all emphasized the unity of God and brotherhood of man. Their message has always been the same one of love, compassion and humility. They come not to found new creeds and religions. They come not to gain suzerainty and dominion over lands. They come to unite, not to divide. 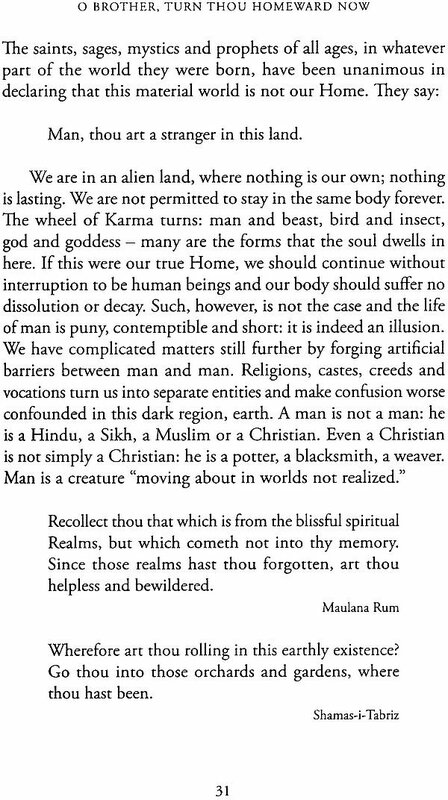 Their mission is to take the longing souls back to their Home, not to take them further astray. They come to lift mankind out of the cobwebs of illusion, not to sink them deeper into the mire. Their life is one of labour and love, work and worship, service and sacrifice. 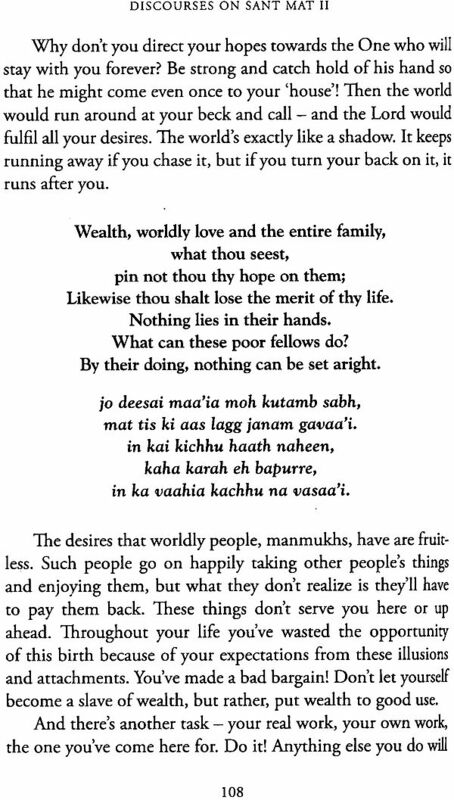 They are entirely wedded to poverty, purity and spirituality. Belief in one God is the cornerstone of all religions. They are different roads, leading to the same destination. The soul of religion is, indeed, one; only it is encased in a multitude of forms. 'Many roads hast thou fashioned: all of them lead to light.' Doubtless their rites and rituals, their customs and ceremonials, their rules and conventions are diverse, but the substance of Reality, the essence of Truth, the basis of Spirituality, underlying them all, is one and the same. The Saints, the lovers of the Lord, turn away from the outer religion of form and ceremony to the inner religion of the heart. They discard the shell and hold on to the kernel. They preach pure and untarnished spirituality, for while the outer differences tend to divide us, the inner silver-cord assuredly makes us all one. 'The object of sight is one, but the angles of vision .are many. Even so, Truth is one but we see it from different levels.' Only deep understanding of this underlying oneness will enable us to meet on one platform and bring peace to the intolerant and the strife-torn world. 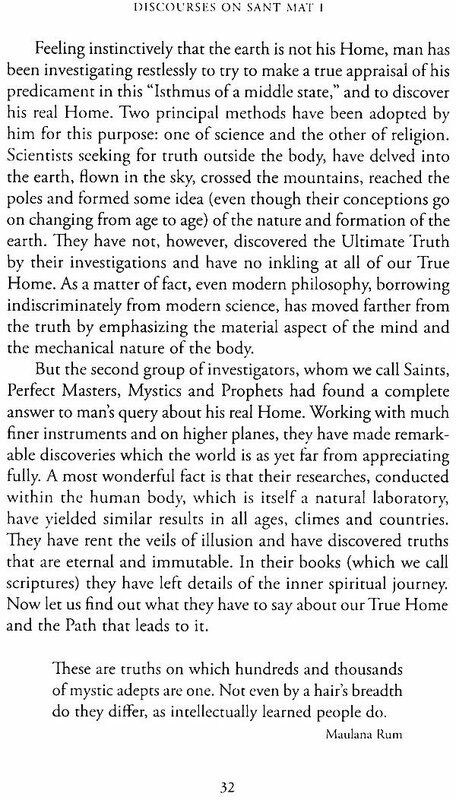 Nobody denies that God is one, that He has created the world, that we can gain salvation by meeting the Lord, the Creator, alone, that the Lord resides not in forest retreats and mountain caves, but in the inner recesses of the heart, that to meet Him, research has to be carried out within the human body and nowhere else, that none has ever found Him outside nor will anyone do so hereafter. They all admit that mind is the veil between man and God; that He can be seen only when this blinding screen is removed. Mind revels in pleasures of the senses. It can be weaned from them only when it gets something supremely superior, sweeter and nobler. 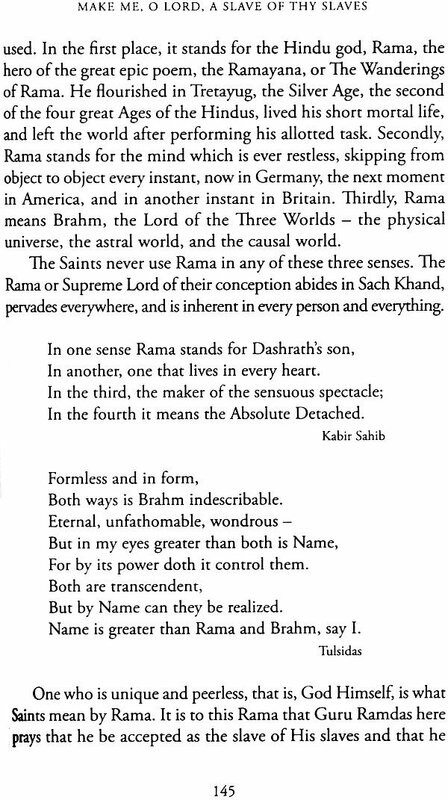 The Saints say that this 'something' is the Divine Melody, Word, the Logos, the Nam, that ceaselessly reverberates at the third eye. It is here that the Supreme Giver bestows His gifts; where flows the ambrosial nectar and it is to this point that the body consciousness has to be retraced, retained and put in the orbit of ever-resounding immanent power. Then shall we gain God-realization. This process calls for no change in religion, no shift in avocation or profession, no distinctive garment or the like. The path is easily trodden by young and by old. The Saints do not make cowards of men. They explicitly enjoin upon all who come under their influence to do their duty by their parents, family and children, friends and relations, the poor and the downcast. Those who love the Creator love His creation, too. Hazur Maharaj Ji has very lucidly dealt with these and other points in His satsangs. He has brought to us a practical way of searching for God within us and realizing Him here and now. I hope that those who are real seekers will benefit from this book. The discourses contained in this volume were given by one of the most widely-known Saints, perfect Masters or Spiritual Adepts of recent times in India. Although he left this earth in 1948, he is still known to millions in India and nearby Eastern countries as the Great Master. His given name was Sawan Singh, and he was born in the small village of Mehmansingwala near Ludhiana, a large city of the Punjab, on the 20th day of July, 1858. After an extremely active life, he left this mortal coil when nearly ninety years of age, on April 2nd, 1948. Erect, eagle-eyed and handsome until the very last, dignified and regal in bearing, yet at the same time utterly humble and unassuming, and with a heart overflowing with loving kindness for all, he was filled with an irresistible spiritual magnetism that drew to him people from all walks of life, from the lowest to the highest. Many from both the East and the West, who were fortunate enough to spend some time in his company, reported that never before or since had they seen such a God-man whose face, filled with mercy and compassion that was plain to see, presented such an amazing combination of spiritual beauty and nobility, august majesty, utter serenity, and quiet but overwhelming spiritual power. This was not all. The Great Master, at all times, radiated an almost tangible spiritual radiance, a higher joy and absolute serenity that no words can describe, continuous waves of light and peace and strength. His voice, vibrant with love, put all at their ease, no matter what their position or social status might be; and his smile and frequent hearty laughter seemed to light up with the highest joy whatever place he happened to be in. His manner, in spite of, or rather because of, his unquestioned spiritual power, was always simple and friendly, with never the slightest trace of pose or superiority. He was a supreme example, to many, of infinite love and compassion combined with infinite power and infinite humility. But words are of little avail in attempting to describe such extraordinary Elder Brothers of the race of men. They must be seen for their true greatness and spirituality to be recognized and realized. During India's long history there have been many so-called "lines" of Saints or Gurus, during the continuation of which each Master has officially and indisputably appointed his own successor. 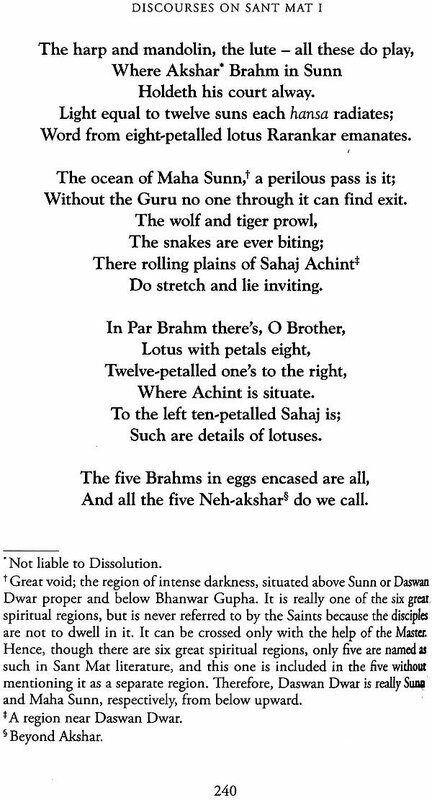 One of the most widely-known of such lines, historically, consisted of the ten great Gurus, the first of whom was Guru Nanak (1469-1539). The last Master of this line was Guru Gobind Singh, who died in 1708. Thus, the line lasted for nearly two hundred years. Sawan Singh Ji Maharaj was the third Guru in the line of Masters that was founded by the great Saint, Soami Ji, who was born in Agra in 1818 and died at the age of sixty in 1878. 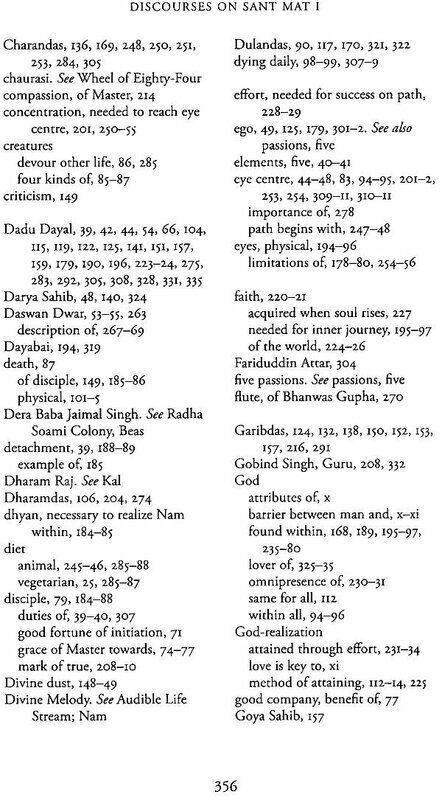 Soami Ji's teachings, which attracted wide attention in India, were basically the same as those of all of the other hundreds of great Spiritual Teachers or Saints who have lived in India and the countries of the Near East down the centuries of history. 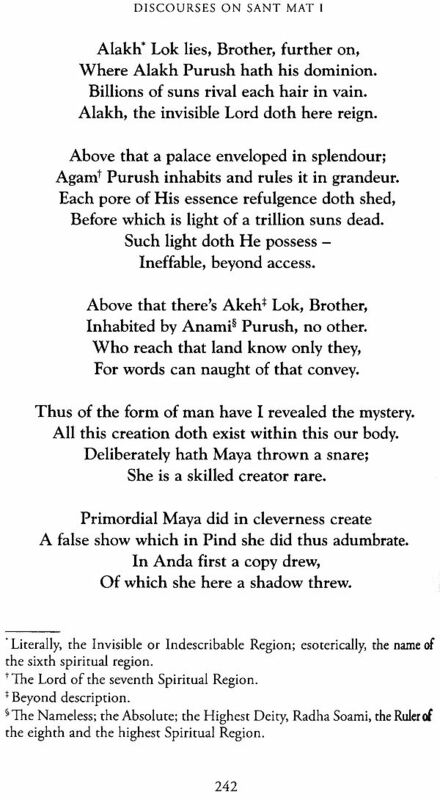 They are embodied in two volumes, the "Saar Bachan" (The Quintessence of Discourse) in poetry and the "Saar Bachan" in prose. These teachings are essentially the same as those of all other Masters, because the truths given out by the Radha Soami Gurus, who teach the practice of the Word of God, have been and always will be the same. They are not man-made, but God made. 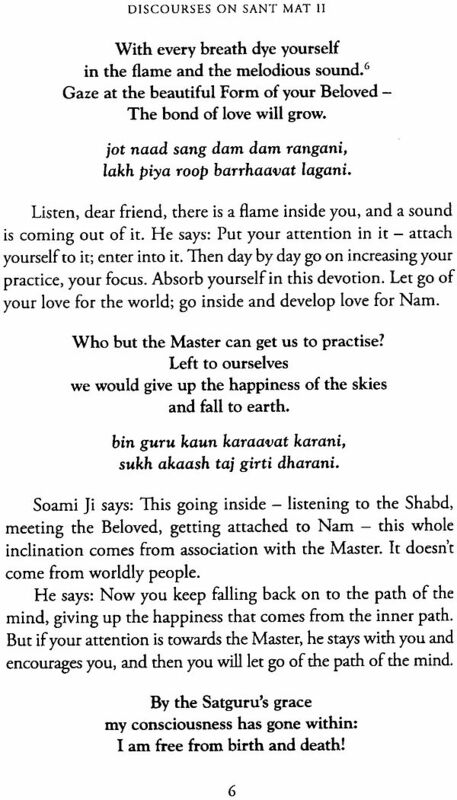 Soami Ji began to hold public satsangs, or to give discourses to spiritual seekers, in January, 1861, when he was forty-three years old, after having spent seventeen years in virtually uninterrupted meditation. 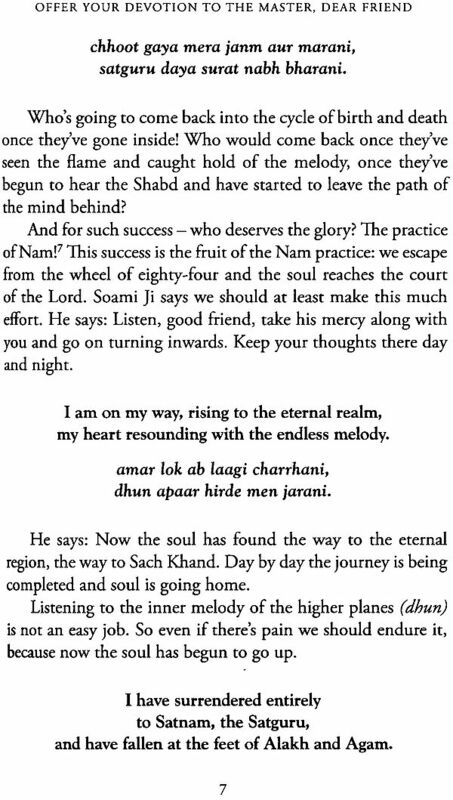 Soami Ji's unique contribution to spirituality was the simple and extremely clear manner in which he taught the ageless and unchanging Truths of the Ancient Wisdom. His gift and his mission of clearly and openly explaining esoteric truths, which had formerly been partially veiled or even hidden entirely by the use of mystical allegories, brought this teaching within the reach of all who were seeking for the real purpose and meaning of existence, whether they were highly educated princes or illiterate peasants. It was in this way that Soami Ji became the founder of what is now known as the Radha Soami teachings, science and philosophy. The term Radha Soami means "Lord of the Soul", and is an appellation of the Supreme Lord, God, which was first used by one of Soami Ji's favourite disciples. Soami Ji's clear and simple method of teaching was continued by Hazur Baba Jaimal Singh Ji Maharaj who, in 1891, settled at a spot on the west bank of the Beas river in the Punjab, a few miles north of the village of Beas. During the first few years, Baba Jaimal Singh lived in a simple hut. But gradually, as the number of his followers increased, other dwellings were built, a well was dug, and a small village came into existence. In this way, there was established the nucleus of the present-day headquarters of the Radha Soami path, a colony which is called both Dera Baba Jaimal Singh (The Camp of Baba jaimal Singh) and the Radha Soami Colony ofBeas, Punjab. Today the Radha Soami path has hundreds of thousands of followers in India and nearby countries and a steadily increasing number of devoted adherents in Europe, Africa and America. It is interesting to note that this growth has taken place and is continuing at an accelerated pace despite the strict rule followed by all genuine Saints and Masters that forbids proselytizing, advertising or any of the other methods that are commonly used to increase the membership of organizations. Baba Jaimal Singh carried on his work in Punjab as a spiritual teacher and guide for more than twenty-five years. Then, early in 1903, he appointed Sardar Sawan Singh to be his successor and the third Master of the Radha Soami line at Beas. Baba Jaimal Singh departed this life on the 29th of December, 1903. It was under the humble and unassuming but indescribably magnetic spiritual leadership of Hazur Baba Sawan Singh Ji Maharaj that the membership of the Radha Soami community had its first great period of growth, its followers increasing from no more than a handful of a few thousand to well over a hundred thousand. 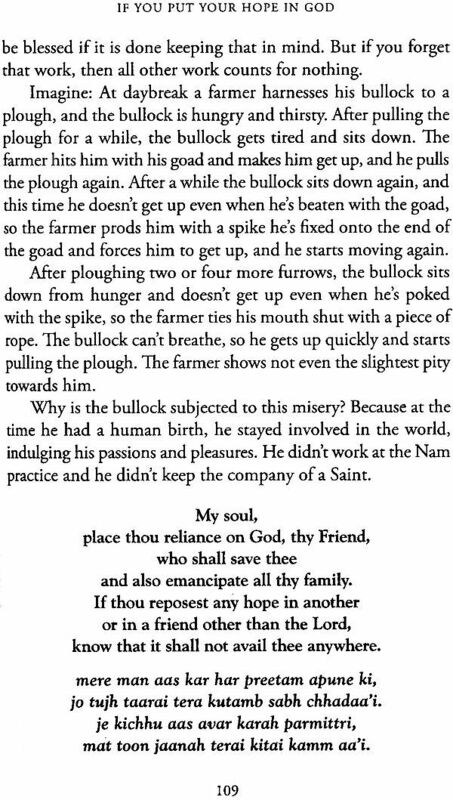 To many in the West who have only a partial or limited knowledge of India's long and rich spiritual history and of the lives of the country's hundreds of Saints and genuine Masters, it sometimes comes as a surprise to learn that all true Masters of the highest order have, almost invariably, followed the rule of earning their own living. This is directly opposed to the idea current in the West that all of India's holy men, both past and present, have lived as mendicants who begged for their food from door to door, or else as ascetics who were fed and supported by their devoted followers. 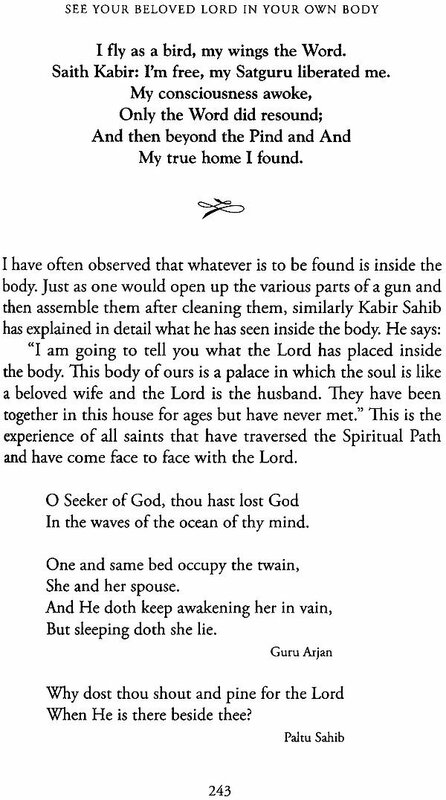 Kabir Sahib, one of the greatest of all Indian Saints, was a weaver at Benares, while his contemporary, Guru Nanak, worked as a cultivator at Kartarpur. Numerous other examples could be cited. 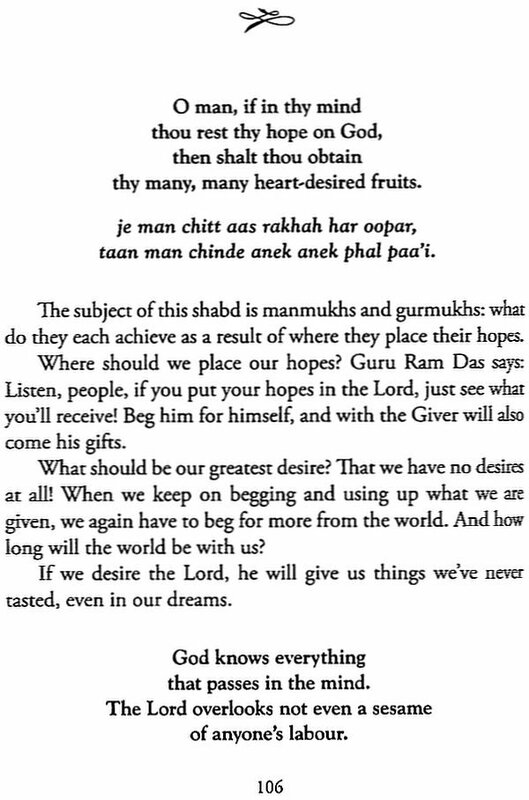 Hazur Baba Sawan Singh Ji was no exception to this rule. Although he was deeply interested in matters spiritual from boy- hood onwards and kept up a continuous search for a genuine and perfect Master, he entered government service as a young man. After studying at the Thompson Civil Engineering College at Roorkee, a small city about a hundred miles north-east of Delhi, he became a military engineer. In this capacity, he served for twenty-eight years, finally retiring in 19II. Among various other duties, he planned and supervised the building of several key highways in the Punjab. During all of his early manhood, he searched with great diligence for a real Master and made visits to many holy men who he thought might know the essence of Truth. But none of them gave him what he needed, a sense of total conviction that his mind and character required before he could commit himself For a long time he associated with a holy man named Baba Kahan, who usually remained in a state of absorption in trance, developed as a result of fourteen years of persistent spiritual meditation. Hoping that Baba Kahan would show him the right path, Sardar Sawan Singh asked him for initiation. He answered, "No, your Guru is somebody else." The young officer then asked him who his Master was so that he should go to meet him. Baba Kahan replied, as have so many other Masters when placed in similar situations, "When the time comes, he will himself find you out." Finally, in 1894 when he was thirty-six years old, he had the good fortune to encounter Baba Jaimal Singh who was visiting the Murree hills in the north-west Punjab and holding Satsang there. 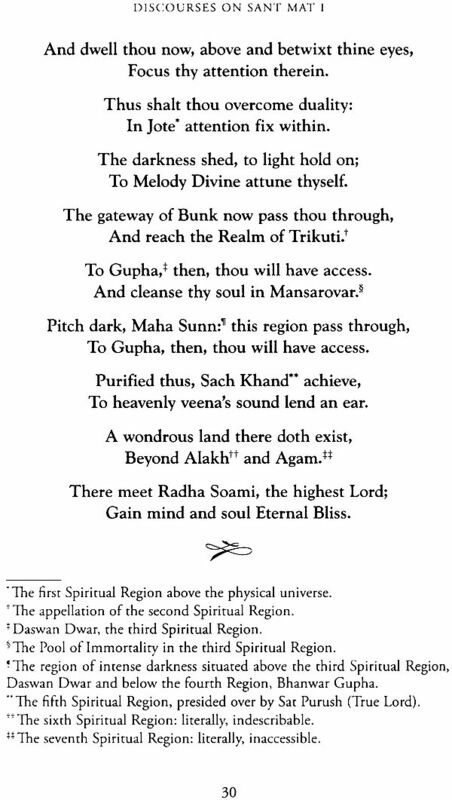 By that time, three years after settling by the Beas river, Baba Jaimal Singh had become well known throughout north-western India, for his saintliness, for the spiritual radiance and power that continuously emanated from him, and for the unshakeable conviction which his teachings and inner guidance inspired in his disciples. One day, shortly after Baba Jaimal Singh's arrival in the Murree hills, he passed Sardar Sawan Singh, who paid him no attention whatever, mistaking him for some Sikh litigant bound for the commissioner's Court. But on seeing him, Baba Jaimal Singh is said to have remarked to Bibi Rukko, one of his disciples, "That is the man we have come to initiate." Bibi Rukko replied, "How may that be when he does not even notice you?" In reply the Master said, "On the fourth day he will come to us." And so it happened that on the fourth day the young officer, Sardar Sawan Singh, having heard that the holy man was holding Satsang, went to hear him. He was profoundly impressed and within a few days was initiated, as Baba Jaimal Singh had foretold. The day of his initiation, an auspicious date in the spiritual history of modern India, was the I5th day of October, I894. From the time of his initiation until the time of BabaJaimal Singh's departure from this world in December, I903, a period of nine years, Baba Jaimal Singh trained his chosen disciple to succeed him as the third Master of the Beas line of Radha Soami Satgurus. When Sardar Sawan Singh became the Master, following the death of Baba Jaimal Singh, he was still serving as a military engineer. He continued in this service till I9II when he came away on premature pension. He was then fifty-three years old. From that time until his death in I948, just before he reached the age of ninety, for a period of thirty-seven years, He served a growing multitude of disciples as their Satguru. For approximately the first twenty-five years of his service as the Master, he devoted himself to providing spiritual training and guidance and to increasing and improving the housing and other facilities at Dera Baba Jaimal Singh. This was necessary because of the increasing number of disciples who came there to visit the Master, to attend His Satsangs and listen to His discourses, and in addition, because a growing number of His initiates, at the Master's invitation, made their permanent homes in the village. About the year I936 the work at the Dera was completed for the time being and the Master, yielding to many requests, began the work of touring or visiting all parts of the Punjab and many other regions of northern and central India where moderate or large-sized groups of Initiates or Satsangis, as Radha Soami adherents are most commonly called, had their homes. When the Masters explain the purpose of satsang, or spiritual discourse, they tell us that it is to awaken their audience to spiritual truth and to whet their appetite for spirituality. They explain that if even one phrase, one metaphor, one word, strikes the listener's heart, it can alter the course of a person's life by turning around his thinking. That is the power of satsang - the power of the Guru's words. This small volume contains twelve satsangs given by Maharaj Jagat Singh, who was the Master at Dera Baba Jaimal Singh' in Beas, Punjab, between 1948 and 1951. Sardar Bahadur i, as he was respectfully called, was initiated in 1910 by Maharaj Sawan Singh. He is remembered as an exemplary disciple and was popularly known even among the staff and students of the college where he taught in Lyallpur" as 'Guru ji'. Sardar Bahadur had only two interests - his official duties and his spiritual practice - both of which he performed with unusual fervour. He gave to his worldly work just the attention it needed, and for the rest devoted himself to the service of his own Master, in particular to his 'real work' of meditation. In 1948, Maharaj Sawan Singh appointed Sardar Bahadur Ji to be his successor. He served as the Guru at Beas until his death in October 1951. A story is told of Sardar Bahadur Ji that soon after initiation he was influenced by a verse he heard from the Adi Granth: You've attained a human body - this is your chance to meet the Lord! No other work will help you: Find a devotee and worship only Nam in his company. 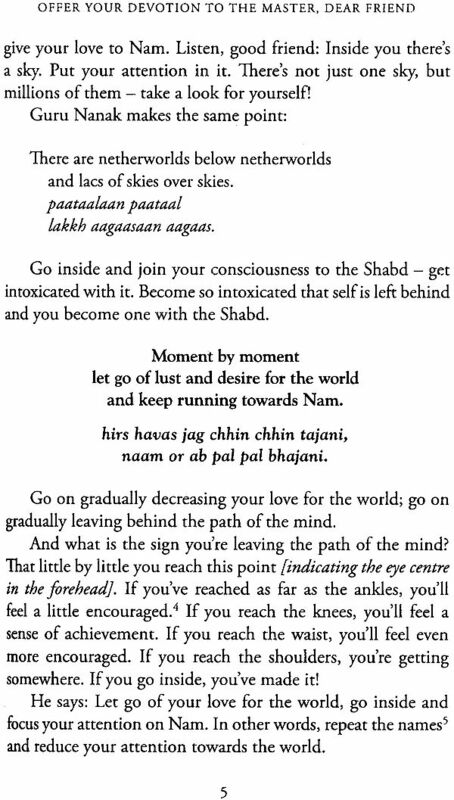 Take refuge with him so you cross the ocean of existence; otherwise you'll waste this birth, dyed in illusion. 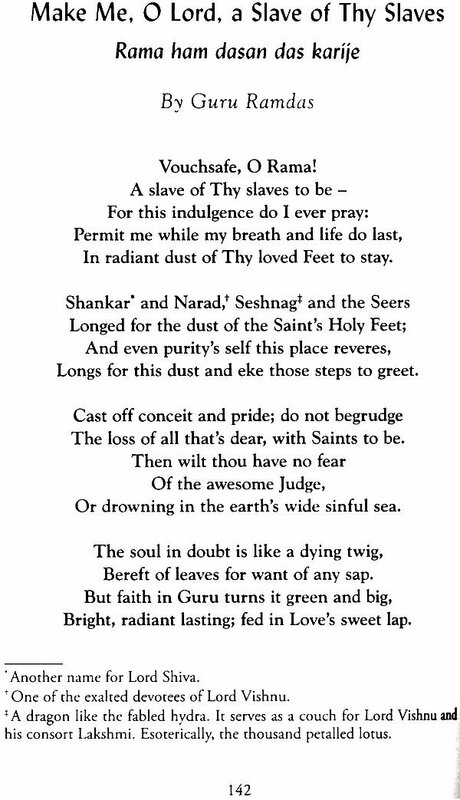 On hearing this, Sardar Bahadur changed the day- to-day pattern of his life to the discipline he was best known for - one of singular application to his spiritual practice at any time he was not working for his livelihood. 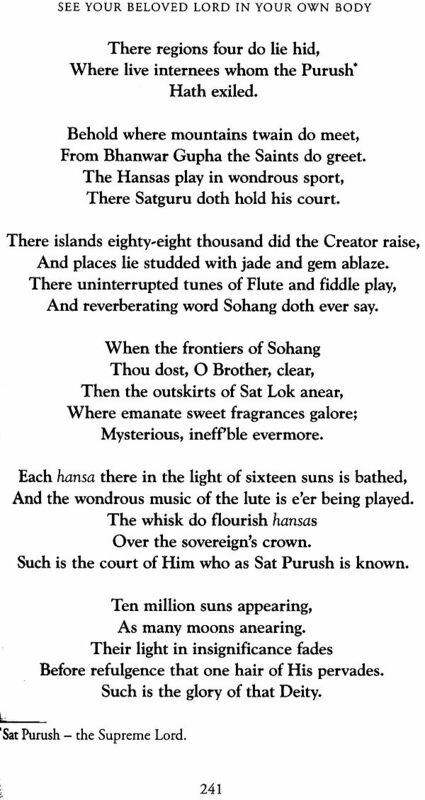 The satsangs in this collection are based on shabds from either Soami Ji or the Adi Granth. Through them Sardar Bahadur Ji again and again gives us the central message of all true mystics: "Let go of your love for the world; go inside and develop love for Nam." While he tells about the Creator and the creation - about the inner regions, the false lure of the mind and the realm of Truth where the Lord abides - ultimately, he says, it all comes back to our relationship with our Guru. 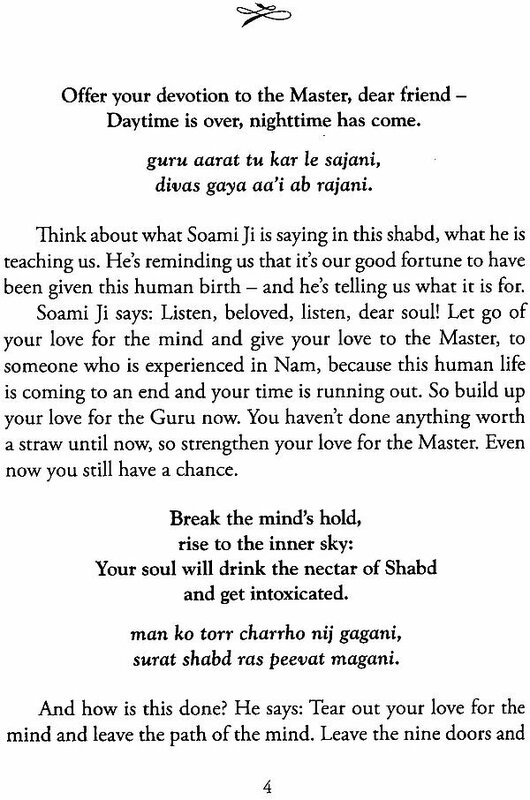 In Sant Mat, the way of the Saints (sant) or Masters, we cultivate our relationship with the Guru in order to experience for ourselves the power of God, the Shabd or Nam that he embodies. 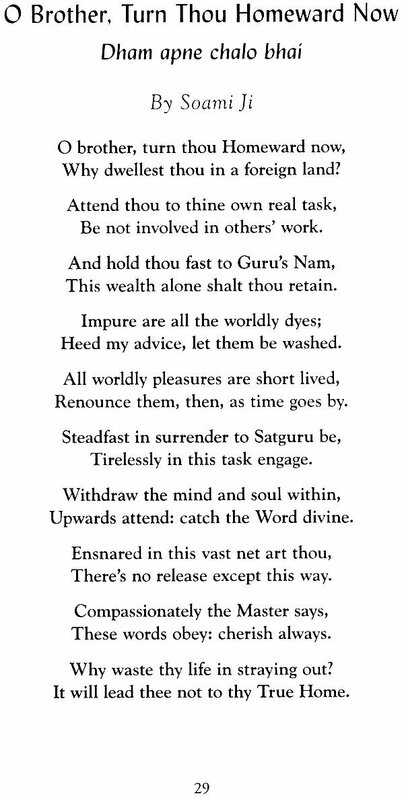 Sardar Bahadur emphasizes that Sant Mat is a path of action: "If we work at the Nam practice, we will experience happiness from it. Let go of words and idle talk; catch hold of Nam and do the practice!" Quoting a Punjabi proverb, he says that our motto should be: "Hands on the job, heart with the Friend." 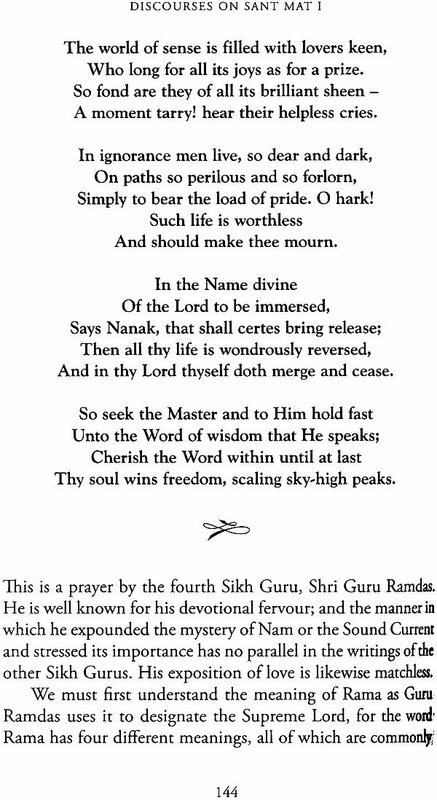 Sardar Bahadur Ji inspired others to apply themselves to the practice of Sant Mat, not just during his short period as the Master at Beas, but also for many years before that as a devoted disciple serving his Master. The discipline he nurtured came from his own experience. It was not an imposition on others, was a living embodiment of those teachings. As these satsangs illustrate, he devoted his last years to helping others follow where he had gone.